Saturday: Morning fog. Partly cloudy, breezy. Highs near 50 early, then dropping. Saturday Night: Partly cloudy. Lows in the teens and 20s. Sunday: Chilly sunshine. Highs in the 30s. Friday‘s storm brought a little of everything to New England; we had snow, ice, rain, fog, warm, and cold, and in some cases all at the same time. That low pressure system is now pushing off of Southeastern Canada, allowing for a new high-pressure system to move in with much colder air by late Saturday, especially at night. In the higher elevations of western and northern New England we have a few snow showers Saturday, otherwise plenty of sunshine with temperatures close to 50 degrees at the coast, before cooling as the wind picks up from the northwest, gusting past 30 mph by sunset and through the night. The high-pressure system settles right over New England Sunday, which means plenty of sunshine with temperatures rising from a low in the single numbers and teens, up to the 20s north and 30s south. Monday also looks like a good day. High pressure is pushing offshore with wind coming back from the southwest, meaning a warming trend with temperatures back to near 40 degrees. Sunshine will fade in the afternoon as the next storm system approaches from the southwest. First Night in New England is going to be a wintry mix; rain south, a mix central, and snow well north, becoming most intense as we approach midnight. 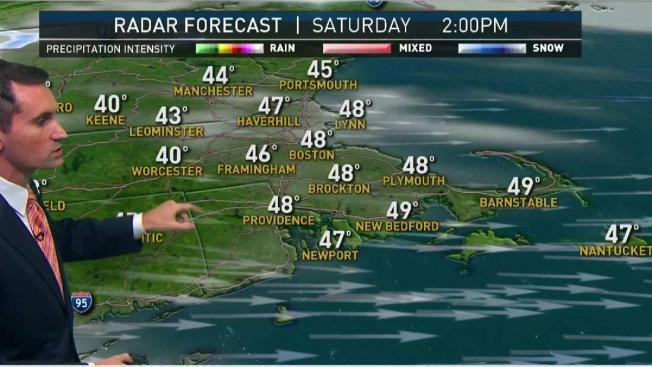 Temperatures will be into the low 40s for southern New England, but in the 30s in the north. First Night Boston likely features rain with the temperature in the lower 40s. Wind will also be gusty from the southeast. Low pressure tracks right across Central New England in the middle of the night. It should progress out to sea for New Year’s Day, allowing for return to sunshine and relatively mild temperatures in the 40s. The next cold front comes in Tuesday night with temperatures falling back down to freezing with sunshine for Wednesday. There after the challenge remains the same: will it rain, or will it snow, on our Friday? Given the recent track record of late, we would guess rain.